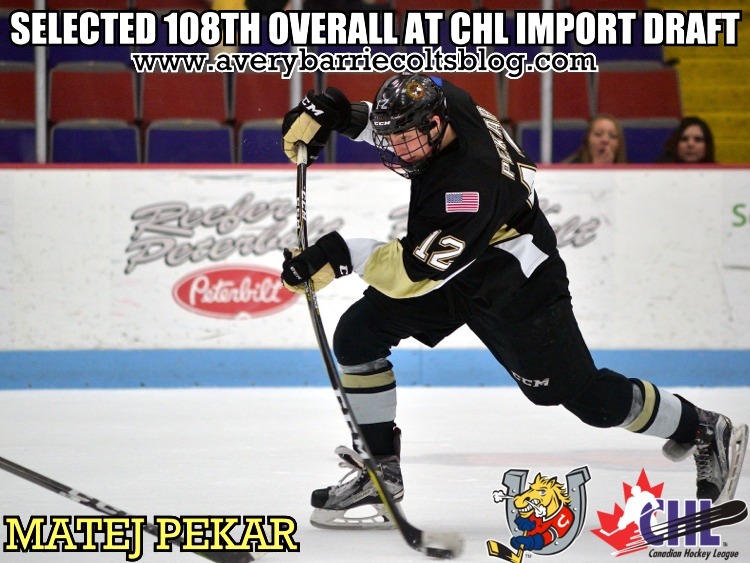 Barrie Colts select Matej Pekar 108th Overall at CHL Import Draft. #OHL - Very Barrie Colts | A website covering the Barrie Colts of the OHL. The Barrie Colts have selected centre Matej Pekar 108th overall at the CHL Import Draft. Pekar spent last season with the Muskegon Lumberjacks of the USHL. Over 56 games he scored 14 goals and 40 assists. He went on that season to be named the USHL rookie of the year. The Czech forward was drafted 94th overall at this years NHL Draft by the Buffalo Sabres. On April, 30th, he committed to Miami, University. Date of Birth: February, 4th 2000. Place of Birth: Turnov, CZE.